The global debate on the discloser of beneficial ownership, especially in the extractive industries, is scaling up. More access to information about who really benefits from the revenues is raising accountability and helping in the fight against corruption. Myanmar, an Extractive Industries Transparency Initiative (EITI) candidate country, formed a Beneficial Ownership Taskforce in June to move the country toward membership. Countries that join the EITI must disclose the beneficial ownership of the companies in their extractive industries by Jan. 1, 2020. 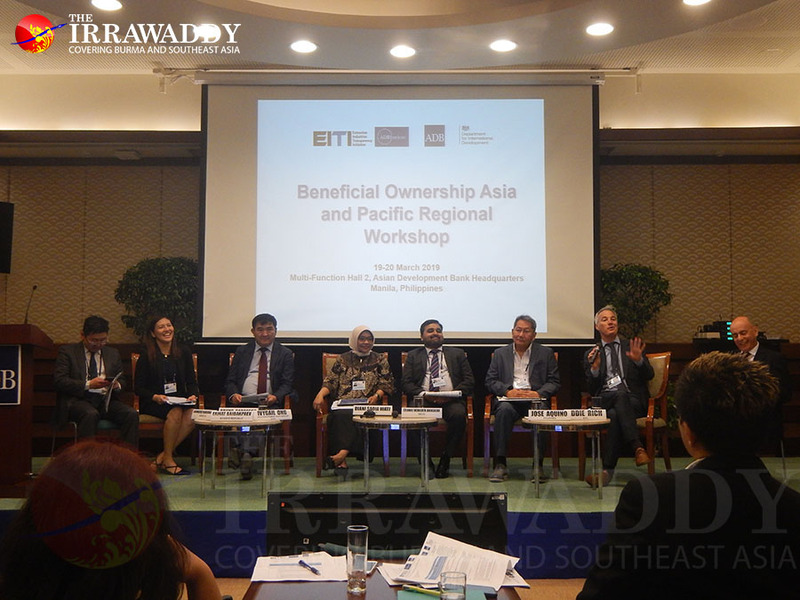 With the deadline only nine months away, the EITI International Secretariat and industry experts stressed the need for more government collaboration between sectors and agencies during a workshop on beneficial ownership for the Asia and Pacific region in Manila this week. A delegation from Myanmar attended the event to learn and share their views. The Irrawaddy spoke with Eddie Rich, deputy head of the EITI International Secretariat, about the initiative’s goals and Myanmar’s progress toward reaching them. What is beneficial ownership and why is it important for EITI countries to disclose beneficial ownership? Beneficial ownership is the process about which you understand the natural owner, the flesh and blood owner, of companies. And this is to deal with what has been exposed in the Panama Papers, the Paradise Papers and lots of recent scandals as a mechanism, that creating shell companies which own other companies but…are hiding the real owner. That has been a mechanism for money laundering, it has been a mechanism for terrorist financing, it’s been a mechanism tax evasion and avoidance. It’s been a mechanism also for nepotism. So the revelation of the Panama Papers and then the Paradise Papers showed the extent of this problem, how systematically individual and companies are gaming the whole system in order to particularly avoid tax, but also some very dark motives. The EITI, the Extractive Industries Transparency Initiative, is a global standard for good governance in the sectors, and they highlight it very early on, in fact before the release of the Panama Papers [in 2016], that transparency of beneficial ownership was going to be a critical issue for anti-corruption in the 21st century, and that it was required that all 52 countries reveal disclosing information about the natural owners of the extractive companies in their countries. And in many of these countries, of course, like Myanmar, this is in many ways the most important sector, politically and economically. Myanmar is also trying to work on that — beneficial ownership, a task force and every preparation. Exactly. So you know who, for example, is behind the gemstones companies that are operating in Myanmar, which has been, as you know much better than me, a source of some of the conflicts. People, or the companies, are reluctant to share the information because that is directly related. They are operating in the conflict areas, or they are concerned about being targeted if they revealed this information. What are the guarantees that EITI or other international advocacy groups can give to these companies for them to share the beneficial ownership information? A couple of points there. First of all the EITI is not an advocacy group. We are a members-based organization with countries that are implementing, who signed up to the global standard that is established. So it is the countries themselves, along with civil society and companies who establish the standard. So a way of saying this is, the companies are the ones who actually asked for this requirement. The companies are the ones who want this because they want the level playing field; they want to know how their competitors are operating. And they feel it’s part of being a safer environment. But you are right, there are also concerns on the other side, that if this information about ownership is known, that the owners themselves could be subject to additional threats. There is no single case that I am aware of where there has been an attack on somebody because of the revelation of beneficial ownership information. We, the EITI, don’t ensure the protection of the people. That is for law enforcement agencies within each country. So if a country commits to the EITI, they commit to full beneficial ownership in the extractive sector, and as part of that, they are responsible for ensuring the protection of the individuals. What could we say [are] the pros and cons, the advantages and disadvantages, of having this beneficial ownership [disclosure] of the EITI countries? The advantages are that it creates better information about the ownership to inform public policy, but it ensures that you can follow the money. If a country has disclosed its beneficial ownership, the owners of the companies, then if tax is very low for a company, you can try and understand why. And you can see one of the owners might be registered in the Cayman Islands, and you say, “Aha, well, maybe that person needs to be domesticated back into Myanmar to ensure that all the money is paid in Myanmar for Myanmar’s resources. In simile, you can see if a license to explore or to exploit resources has been given to somebody who has been politically exposed, is a relation of a minister or senior officials. So to make sure there is much fairer system. That’s why companies like it, most companies, because it creates a level, a more fair playing field. Those are the pros. The cons, we hear that it’s difficult to collect the information, and I think we need to understand that. And those are the kind of issues we are discussing. We hear it is difficult to define what a beneficial owners is, or establish a threshold, or ensure that the information is accurate, make sure that you got the right disclosure mechanism. These are all the kinds of questions that come up, and that’s what we are discussed in these two days. Myanmar is now a [EITI] candidate country, but what do we need to do to become a full member? Myanmar has undertaken validations and it is being assessed right now, and the [EITI] board will make decision on that, I think, in the next month or so. And it is likely that it will direct you to a few — it will indicate that there has been very positive progress. Myanmar has come a way in last few years about declaring, disclosing lots of information about the sector. It will indicate one or two areas where there are specific actions required in order to become a full member. Until that, until the board has made the decision, I don’t think I should indicate what they will decide. We’ve advised them and made recommendations to them, but this is finally the board decision. So hold on a month or so and you should have a lot more information. You have [put] a lot of focus on 11 countries in Southeast Asia and Eurasia. Compared with Myanmar, are we [in a] similar situations with other countries in terms of EITI candidacy and the work that MEITI has been doing? What are the challenges and similarities? Myanmar is learning a lot and I think other countries are learning also from Myanmar. That’s kind of one of the key advantages, I think, of the EITI, that there is a global network that learns best practices from each other. But each country also has its own specific situation. In Myanmar, you have a lot of state-own enterprises and you have these funny things called your “other accounts” as part of the state-own enterprises, and trying to unpick and understand what is part of these other accounts is a key specific issue for Myanmar. And on beneficial ownership, you have established of course this company registration under DICA [Directorate of Investment and Company Administration]. That’s come in long way and that’s going to try to establish more details. Systematically, when a company registers, they will have to disclose their ownership. So, again, it’s learning off other countries and it’s also establishing good practices that other countries may wish to follow. What are the next steps for guaranteeing the information release [about] beneficial owners? What are the next steps that you have prepared, or have you had any discussions to have protection of those data of the beneficial owners, because some are concerned about being targeted by the criminal groups? Yes, as I said, I don’t know of any specific cases where this has ever happened. I’m not saying it’s not a legitimate concern. It is. But we need to understand much better what is the real concern? Is there ways, and different ways in different countries, that that could be addressed? Does the address of each person actually need to be put, declare publically? Not necessarily; that’s a national decision. Is this information already known? Actually, does the beneficial ownership discloser make any different to what’s already out there? What is the law enforcement like? What are the personal protections like? So I think it’s too simplistic to simply say, ‘Ah. OK, because of threats of kidnapping and other targeting, we must say no to disclosure.’ I think we need to understand the problem better and looks for particularly country specific solutions, because they are going to be different in different countries. How would you summarize that EITI and beneficial ownership are linked together? Beneficial ownership is absolutely essential to a good governance sector. I talk often about the transparency triangle, which is: if you know the contracts, and you know who the owner is, and you have the payments which were paid for a particular project in terms of tax or royalties, then you should have a complete picture of whether the country got what it should have. If I have a contract with you, and you don’t pay me all of that, then I want to know who you are, where you’re from. And so I can see, why did she not pay me the full amount. So that’s part of the picture. We know who the people are, we know what they should have paid, and we know what they did pay.